What does the colour yellow say to you? Inspired by the vibrant country of India, the intense new colour for xari conjures up an exciting image of fun and liveliness decorated in bright colours and intricate patterns typical of this culturally rich land. The contrasting black chassis combined with the warm orange and brown hues of the seat pad and parasol tie together the colour scheme, creating a fun yet elegant product. Complete the look with a matching Trendy Changing Bag, Footmuff or Sunny Veil to protect your little one from the Sun’s harmful rays. The accessories and seat unit sport an intricate mandala design that pays further homage to India – a beautiful country that has truly inspired us to create this out-of-the-ordinary product. A dull, run-of-the-mill pushchair? 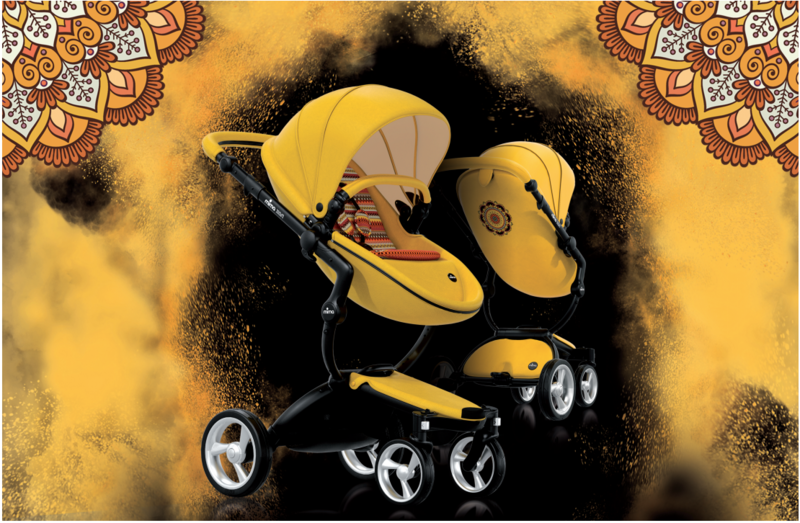 No thanks – dare to be bold and be the envy of the neighbourhood with one of only a handful of pushchairs in this special, rich colourway. Dare to be bold with the mima xari YELLOW! Limited Edition.